Insight Stones® is a tool of divination of my own creation. It came to me in a flash as I was flying back from Chicago one afternoon in 2007. I saw the board in my mind’s eye, I knew which stones needed to be in the kit, and wrote the guidebook before the plane landed. Once home, I designed the board and did the layout for the guidebook. 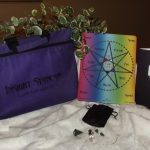 Insight Stones® came into being as a unique, highly accurate tool to add to your magickal toolbox. Check out Insight Stones® here. 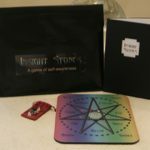 Insight Stones® has gotten rave reviews! The 2-hour course teaches students how to use Insight Stones as a tool of divination and deep understanding. Techniques for getting information from the board include use with the stones and pendulum. Journaling is also discussed. The cost is $25 for the course alone. 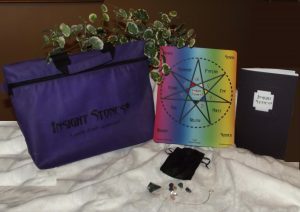 Save $5 when you purchase both the course and your copy of Insight Stones (retail price $35) for $55! This class shows you how to get the most out of this oracle. Please note: All products and services offered and purchased on DianeWing.com are subject to our Policies.